This is another one from the archives. Back when our house was filled with nappy boxes galore, and Mr 1 was obsessed with anything with wheels, I made this simple parking garage. 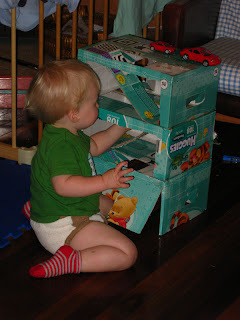 I later made a wooden one which was more durable, but this nappy box garage was very very well used until then. I took 2 nappy boxes, cutting them in half. On the top two box-halves the front wall was cut open, leaving an inch around the edge to give strength. The ramps are cut from each deck, and folded down to be sticky taped in place. The door at the bottom was cut only on two sides so that it could be lifted up. The whole thing was held together with sticky tape.